Beck Long, a student at École Edward Schreyer School, has received a 2019 Yes I Can International Award from the Council for Exceptional Children (CEC). If everyone demonstrated the same spirit of volunteerism as Beck Long does, the world would be a better place. 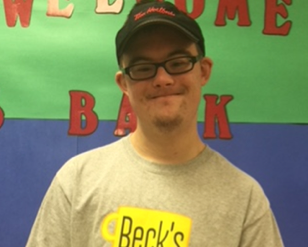 Beck is working on learning vocational skills and has started his own business "Beck's Beans 2 Go," a local coffee delivery service. Beck takes coffee orders from staff at the local high school, pharmacy, credit union, quilt shop and police detachment. With the profits Beck makes from his business, he selects a charity to donate this money to at the end of the school year. In June 2017 Beck made donations to Manitoba SwimAbility and also the Brokenhead - Beausejour Pioneer Village Museum. This year, Beck has purchased two apple trees for the high school’s outdoor classroom and will also be presenting, for the second time, the "Beck's Beans 2 Go Award" at graduation to a graduate who has demonstrated a high-level of volunteerism to the community. While Beck is learning important vocational skills with his small business he is also working on literacy, numeracy, banking, communication, community connections, and motor skills. Beyond his work, Beck is also a member of the school’s Special Olympics team and has performed in the high school evening drama productions. CEC is proud to honour Beck with this award in the transition category. 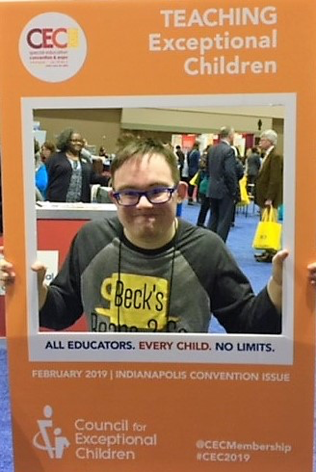 Beck received his award at the Yes I Can Awards Ceremony on February 1, 2019, at the Indiana Convention Center in Indianapolis, Ind., as part of the CEC 2019 Convention & Expo. The Yes I Can program recognizes the accomplishments of 12 students with exceptionalities in six categories: academics, arts, school and community activities, self-advocacy, technology, and transition. The Council for Exceptional Children (CEC) is the professional association of educators dedicated to advancing the educational success of children and youth with exceptionalities that accomplishes its mission through advocacy, standards, and professional development. Learn more about CEC at www.cec.sped.org.